Sealed, new coin box of 2017 nickels Denver U.S. Mint. $20 face value box. Two boxes for a total of $40 face value. If you are a coin dealer and wish to buy in bulk quantity, inquire directly for our bulk ordering discount pricing. 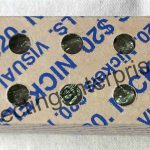 Limited coin collector item: $20 face value box size sealed 2017 Denver Mint nickels. This order is for 2 boxes, $40 face value total.